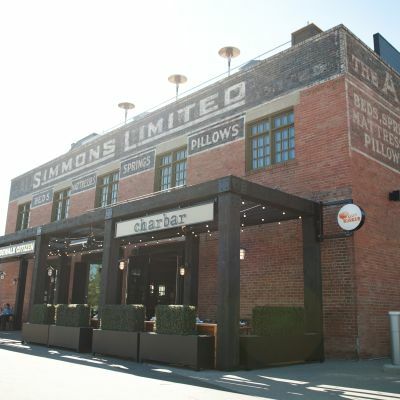 Located in the revitalized East Village and housed in the historical Simmons Building along the Bow River, charbar is spearheaded by executive chef Jessica Pelland with the support of co-owners and chefs Connie DeSousa and John Jackson. This locally-relevant and globally-inspired restaurant partners with Sidewalk Citizen Bakery and Phil & Sebastian Coffee Roasters to create a collaborative and communal destination. The restaurant features an ultra-dry aged Alberta beef display, a meandering ceviche raw bar, and riverfront and rooftop patios. At its heart is a custom-made Argentine wood-fired grill honouring the art of asado and the culinary inspirations of Spain and Italy. Latin music adds energy to the Argentine dining experience, and is our preference for musicians, however, acoustic, folk, and jazz are a welcome style. Second floor, with diners seated all around, overlooking the main floor. Historic Simmons building, room is quite large and open to main floor.